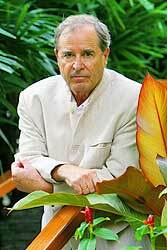 In this interview with the Bangkok Post, internationally acclaimed U.S. travel writer and novelist Paul Theroux said he believed Thailand was the most accommodating of all of the countries in Southeast Asia. "I think that Thailand is the most accommodating, because Thais don't feel threatened by foreigners and feel like equals," he said. "National pride is important, because it gives you self-esteem. Many countries have been colonised and they are conflicted." Prior to this interview, the last time Theroux was in Bangkok was in 1985, when he was the keynote speaker at the SEA Write awards, held at The Oriental.